Hello. I'm Erena Shkodra, of Mathnasium of Clarkson, your neighbourhood math-only learning centre. We help kids in grades Grade 1 to Grade 10 understand math by teaching the way that makes sense to them. We are really excited to be OPEN now and serve the children of the Clarkson community! Call us at 905-823-0005 to book a free assessment!! My child always looks forward to going to Mathnasium class and learning new concepts and being challenged by the problems. The instructors are friendly, competent and patient. The environment is conducive for learning. My kids are very happy with going to the Clarkson location...instructors are wonderful and the facility is very cozy and welcoming! My daughter was having problems in math. 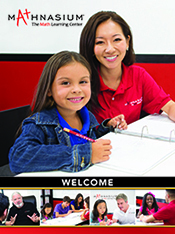 She loves the teaching style and the fact that she can get help for her homework. Mathnasium prepares her for test and as a result she has been getting A ‘s in Math . Excellent teaching and contact with parents. Would love Friday option at clarkson location too! Great patients and communication with the kids by explaining math problems and having them feel confident through the problem solving. Its amazing. My daughter loves it, which was impossible prior in regards to wanting to work on math. Thanks. You can use my comment for marketing ,but only initials please. My daughter loves it:) I've already recommended this place to family and friends. A month ago my husband and daughter would be flustered with each other trying to go over homework at the dinner table. Usually this would end with my daughter in tears. Not the way you want to learn math skills. She loves going to Mathnasium in Clarkson. She takes her responsibility of attending 10 classes a month very seriously. Raves about the tutors and actually said "she loves this place" Lauren words!! The teachers are engaged and dedicated to the learning progress of my children. Our children are not only starting to really understand Math - they are starting to LOVE MATH. Thank you Mathnesium Clarkson! My daughter did not have a lot of confidence this year in math and felt she was struggling and behind the rest of her classmates. She actually noticed the Mathnasium sign while I was driving one day, and she asked for math classes for Christmas! We did exactly that - and its been the best gift ever! She loves going to her classes; she has already attained many basics that were missing; and she's excited about math now! We are grateful to the team at Mathnasium at Clarkson for encouraging my daughter and enabling her to develop life-long lessons that will serve her for years to come! Our girls enjoy their time at Mathnasium, excited to learn math in a fun, supportive and encouraging environment. Highly recommend this investment in your child’s education to build your child’s confidence in math, in their ability to solve problems and most of all, feeling comfortable and confident within themselves. Great caring staff. They definitely try hard for my son to succeed. My son does not like math, but he is always happy to go to mathnasium.. So grateful for the consistent attention to the ongoing and changing math needs of our two girls. Their time spent at Mathnasium is time very well spent indeed! I like the approach of thinking outside the box when teaching students who have a difficult time grasping a concept. The staff's ability to get to know the student's ability and strengths is also reasurring knowing it is an individual approach. I recommended you to a friend who is highly interested. Our children actually enjoy going to Mathnasium! This was not their experience at another popular after school math program. I was given an honest assessment of their abilities and a strong, forward looking program specially created for each of my children. I am confident that my children actually understand what they are learning and that they will master math (while loving the process)! What a joy it has been to see both my daughters enjoy learning math! Along with the many "ah-ha!" moments they have experienced when a concept they have struggled with at school finally makes sense! My girls are eager to share with us what they have learned and look forward to their next visit. In a short period of time, I can see a shift in their confidence and their positive outlook on learning something new. Thank you to the team at Mathnasium of Clarkson -- for fostering an encouraging environment that boosts confidence of these young minds! My two children have been attending Mathnasium for years (since before grade school). I tell everyone I see touring Ms. S’ centres (she has two locations now) that registering is a good decision and Ms. S is amazing. I have confidence that my children will not struggle in math and any areas in need of improvement will be identified and addressed. The proof is in all report cards to date! Ms. S has been “adopted” by my children as a family member (they love her) and I consider her a dear friend. Having both my girls at the Clarkson Mathnasium location has added tremendous convenience. The girls have always loved going to Mathnasium after school but now it is even easier for them to benefit from the time they can spend there. Under Erena's watchful eye, the children have not only improved their number sense and general math skills, but more than that they have developed a love for math and gained confidence in their abilities. We are so very thankful to everyone there for the careful attention to the girls' progress and for implementing a program that is appropriate for their levels. Meaning, that they are challenged by new concepts without being overwhelmed and are allowed to gain mastery over the concepts learned to instil confidence in their own abilities and a desire to learn more. I have recommended Mathnasium of Clarkson to others, and would enthusiastically do it again. Many, many thanks for providing the math support to our girls that no other program has been able to do!